From our initial analysis, we arrived at 9 questions (10 variables) with which we could achieve kappa greater than 0.75, for both national and urban comparisons. However, we noticed that these 9 questions grouped together those in the bottom 2 quintiles. We added two more variables in order to better differentiate the bottom 2 quintiles. The graph below illustrates the difference between the EquityTool generated index and the full DHS wealth index. 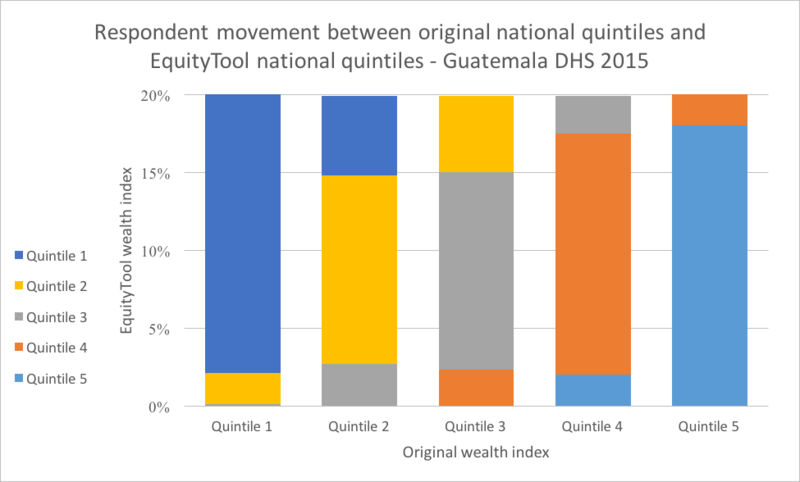 Among all of those people (20% of the population) originally identified as being in the poorest quintile, approximately 89.5% are still identified as being in the poorest quintile when we use the simplified index. However, approximately 10% of people are now classified as being in Quintile 2. From a practical standpoint, all of these people are relatively poor. Yet, it is worthwhile to understand that the simplified index of 11 questions produces results that are not identical to using all 36 questions in the original survey. This tool provides information on relative wealth – 'ranking' respondents within the national or urban population. The most recent available data from the WorldBank indicates that 9.3% of people in Guatemala live below $1.90/day. This information can be used to put relative wealth into context. People who live in urban areas are more likely to be wealthy. 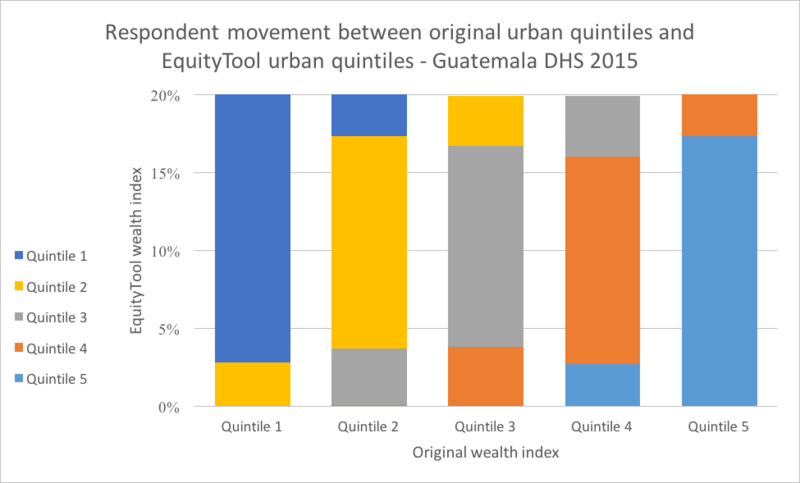 In Guatemala, 40.6% of people living in urban areas are in the richest national quintile, compared to only 4.7% of those living in rural areas. Some municipalities in Guatemala are wealthier than others. It is important to understand the country context when interpreting your results.